Which Is The Best Hook Size For Trout Fishing? →Which Is The Best Hook Size For Trout Fishing? 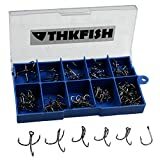 One thing I am sure of is that even as you search for fishing hooks, either in websites or the tackle shops, you will be spoilt for choice because they are very many. There are many hooks of varying sizes and from different manufacturers. The most important thing about fishing is to get shipping equipment of the right size and make that suits your favourite style of fishing, which I agree is a difficult task. More than a half of the missed bites can be attributed to dull and inappropriate and dull hooks. Only little things matter in trout fishing. You only need to get the simple bits right and do them perfectly. With that, you can be sure that you will e﻿﻿﻿﻿﻿﻿njoy ﻿﻿your trout fishing spree. I love fishing for trout. Trout is just that fish which you can prepare for a meal at any time of the day. Most of the anglers do inquire on the best size hook for trout. The hooks are the most significant bit of the fishing gear. There are also many differences between types of hooks and hook sizes. Keep reading to get the juicy details which will help you with the puzzle. Which Is The Ideal Hook Size? Trout have very good sense of sight and can easily detect hooks, and so you need your hook to be quite invisible to avoid making the trout suspicious. In lowland lakes, with water that is a little murky you should use hooks which are of sizes 6” to 8” and for bigger trout a hook of sizes ranging from 4” to 2” are ideal. In crystal clear waters, the best hook size is 10” or one that is bigger. Always be careful when using tiny hooks because they are a little complicated to work with. Hooks whose size is shown by a number followed by ‘0’, for example; 2/0 are bigger. Their size increases as the number increases. To illustrate this, a hook of size 4/0 is bigger than that of size 2/0. Hooks with numbers not followed by ‘0’ get smaller with an increase in the number. To illustrate this, a hook of size 14” is smaller than that of 12”. Always use the smallest hook possible to catch trout. The trout have exquisite lateral lines which sense or detect any pressure and vibration in their surroundings. When choosing the hook, be cautious on the size of your bait in relation to the proportion of the size of the hook. The trout have a good sense of sight which makes them realize when something is out of place. I also found out that bigger hooks do kill the ﻿﻿live bait﻿﻿s very fast such that they do not perform their purpose as it is expected. The best sizes range from 8” to 10” and 12” to 14”. Trout have very sensitive sense of sight and feel. To increase the chances of catching them, you need to have a very sharp hook. 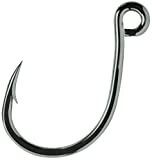 Most of the bites we miss out on can be said to have been caused by the use of a blunt hook. You can choose always to have a hook sharpener which is a bit cheaper or, constantly keeps changing your hook. Configuring your hook is important especially when you are using live baits. Hooks configured using the gang hooks are very effective; mostly when you are using a worm to lure out the trout. You can also modify a 10” hook tied at the front of a small treble hook to work as the gang hooks. This works best when you are using a power bait rather than live worms. This involves tying some fish hooks in tandem to make gang hooks. 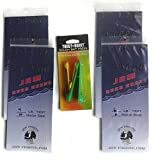 This is a great choice when fishing for trout with a live bait and when using the drift fishing technique. The best sizes of gang hooks would be 8” and 10” in trout fishing. Treble hooks are popular when anglers are using dough style trout baits, such as the power bait or soft cheese such as the marshmallows. You need a hook which is of size 12” or 18” to fish for trout. Most anglers make a mistake of using bigger hooks with the hope that they will catch a bigger fish now that they are using a bigger hook. These are most popular among trout anglers. The best styles for single hooks in catching trout are bait holder and salmon egg. The best size for a single hook is 10” to 12”. The rule of the smaller, the better still applies. Most anglers prefer single trout hooks which are painted red for trout. I would recommend that you use the JRW Gang Hooks which I found to be the most suitable. 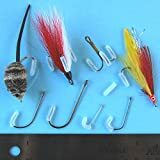 They are available in varying sizes, and so you can select the best-sized hook. With this information, I am sure you will never again wonder about the appropriate size hook for trout fishing. Always remember the quote, “smaller is better”. The reason why you should trust this quote is that trout are a species used to eating many small meals throughout the day. You should strive to match your bait to the meal size of the trout to get them to make more bites. If you need clarity on anything in the article feel free to ask. Also, if I have left out anything you can let me know and also leave a comment.